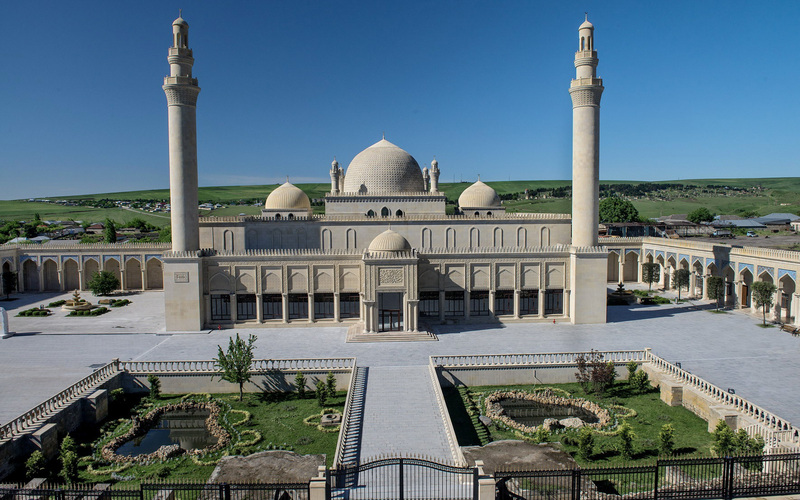 Margraf enters new markets in Central Asia with a prime contract for the supply of precious marble destined to the restoration of Juma Mosque in Shamakhi, Azerbaijan. This challenging project was started by President Ilham Aliyev in 2009 and executed by Architect Elvin Najafov in close collaboration with Margraf's technical staff. Works were completed at the end of 2013. The building is a fabulous example of Islamic Architecture and Margraf's marble floors awake memories of the ancient Muslim décors and geometrical designs; in particular, the ornament underneath the central cupola representing a flower with twelve petals made in Azul Bahia, is used all around the wall edges of the adjacent halls as in a Greek key border. In one of the most sacred places in the country, the rose window underneath the cupola plays a protagonist role: this geometrical design on a Bianco Laser floor is encompassed by a floral crown made with extremely valuable materials as Azul Macaubas, Rosso Francia, Giallo Siena, Giallo d'Oriente, Rosa Portogallo, Monaco Light, Onice Verde and Bianco Sivec. Juma Mosque, also known as “Friday Mosque” to commemorate the day dedicated to Allah, was built in 743-744 a. C.
It is located 106 km away from Baku capital city that is considered a key city along the famous “silk road.” Over the years, the mosque has undergone numerous reconstructions after many earthquakes and fights battled to protect this strategic area. The last destruction dates back to 1918 when the armed forces of the Armenian Party “Dashnaktsutiun” started a devastating fire that razed the whole city to the ground. 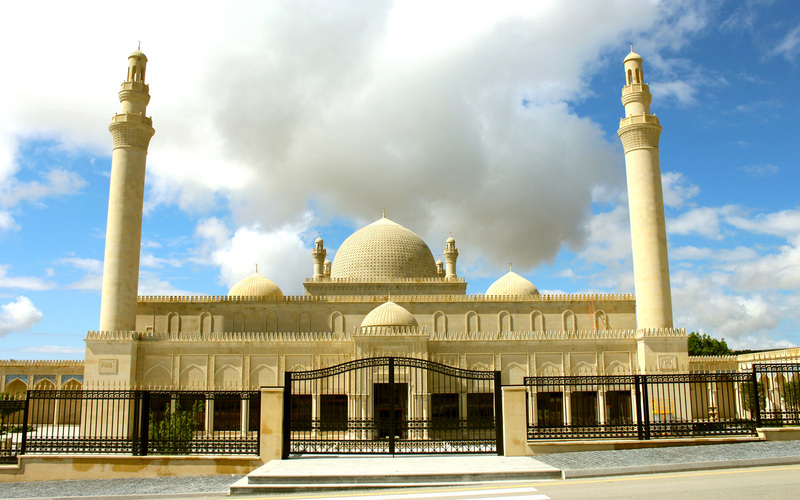 The mosque, a unique construction for itself, stands out from the other monumental buildings in Azerbaijan for its shape and size. 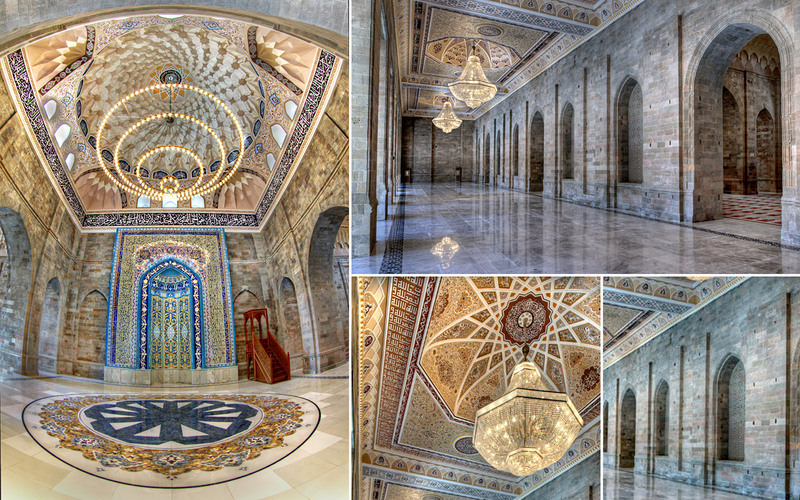 The central cupola and various internal areas of the main hall resemble the Derbent Mosque, which is the main one in the country. Its rectangular floor plan is divided into three, square chambers communicating with each other through large wall openings. The most significant architectural interventions were carried out by Architect Josef Plosko in the early 1900's. With his project, the Architect created three monumental chambers of the same size internally to the mosque, thus adding some typical oriental traits to the traditional basics of Islamic architecture. For over a century, Margraf has been siding with international architects in their master works in Italy and abroad, thus becoming an icon of the excellence of the “Made in Italy” all over the world. Valuable marble entering the halls of international architecture and bound to leave a permanent mark.